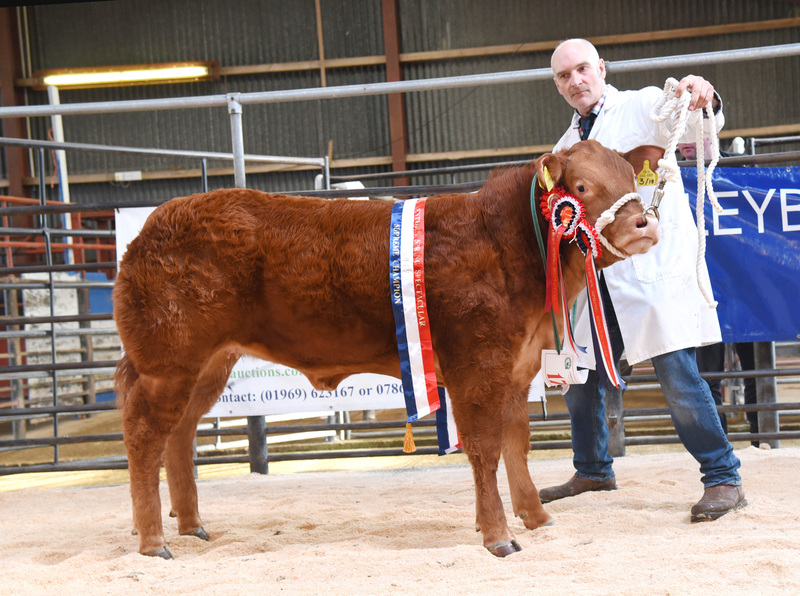 Mr Kitson, of Kitson & Sons Butchers, which has shops in North Yorkshire and Durham, fought off fierce competition at the ringside to claim the title winner at Leyburn Auction Mart’s annual ‘Spring Spectacular’ for show potential cattle held on Saturday March 2nd. Champion from John Smith-Jackson selling for £9,200. 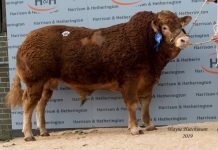 It set a new mart record price by far for a store animal and is thought to rank among the highest prices ever paid for a commercial beast anywhere in the UK. It was certainly the best-ever selling price achieved by breeder and exhibitor John Smith-Jackson, who runs the Hightown herd near Haltwhistle, some 15 miles east of Hexham in Northumberland. “I could not believe it. 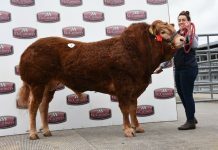 I am still in shock,” said the well-known showman two days after the sale. 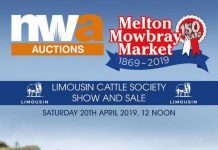 Mr Smith-Jackson’s Leyburn title winner, a home-bred red Limousin-cross, is an April, 2018-born daughter of the herd’s main stock bull, Hightown Jacko, who is himself a son of Shire Apollo, acquired back in 1985. The herd still retains a few straws from the high performance bull. Buyer Mr Kitson shares the breeder’s enthusiasm. “She is one of the best beasts I have ever set eyes on – at the leading edge of show cattle. Bidding at the ringside was frenzied and I had to battle tooth and nail to claim her,” he said. The supreme champion heifer will now be paraded under her new name – ‘Kitsons Jewel’ – at local, regional and national shows this summer. An appearance at the Great Yorkshire Show is on the agenda, while Mr Kitson is also considering taking her over to Holland for the country’s premier Easter prime cattle highlight, Paasvee 2019, next month. Two years ago, he became the first-ever English showman to compete at and fly the flag for British butchery at the famous open air cattle showpiece in Schagen. 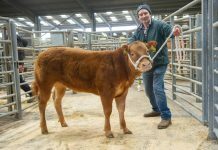 “Kitsons Jewel is fully halter-trained thanks to the hard work and dedication of Mr Smith-Jackson and his team. We have great expectations for her in the show arena this year. We are really looking forward to it,” said Mr Kitson. Show-time over, Kitsons Jewel will eventually find her way into the food chain at Kitson & Sons Butchers’ three retail shops in Northallerton, Stockton-on-Tees, and Hutton Rudby, along with its latest Five Houses Farm Shop and Kitchen in Crathorne, launched in autumn, 2017, and going really well. Mr Kitson is renowned for buying high profile prime cattle champions from across the UK – and paying highly for the privelege. In the run-up to Christmas last year he invested over £100,000 when securing a total of 50 award-winning prime beef cattle at many of the country’s seasonal fatstock shows purposely for his customers’ festive tables. Among them were the supreme champions at the prestigious East of England Winter Stock Festival in Peterborough and both the English and Scottish Winter Fairs. It was quite possibly the biggest ever buying coup by an independent family-run UK butcher. Pic caption 1: John Smith-Jackson with his Leyburn Auction Mart ‘Spring Spectacular’ supreme champion. It fell for a record £9,200 to local butcher Anthony Kitson. Anthony Kitson is on 07778 596590, Leyburn Auction Mart’s Stephen Walker is on 01969 623 167, mobile 07866 358 130. John Smith-Jackson can be contacted on 07803 126717.